Japanese Prime Minister Shinzo Abe addresses the annual meeting of the World Economic Forum in Davos, Switzerland, Jan. 23, 2019. Japan's prime minister says China's slowing growth, Brexit woes and U.S.-China trade disputes pose risks to the world economy, while decrying the World Trade Organization as "behind the curve" and in need of reform to help ease trade tensions. German Chancellor Angela Merkel addresses the annual meeting of the World Economic Forum in Davos, Switzerland, Jan. 23, 2019. 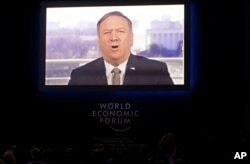 United States Secretary of State Mike Pompeo speaks through live video conference at the annual meeting of the World Economic Forum in Davos, Switzerland, Jan. 22, 2019.